My second Alternative Thanksgiving talk and demo is tonight at 6 pm at the Roanoke Main Library. I know most of you can’t make it, but in order to feel like you’re there in spirit, I’ll be discussing vegan baking, bread making, and I’ll be making Vegan Gluten-Free Cornbread and Vegan Gluten-Free Pumpkin Pie. As wonderful of an experience as these two talks and demonstrations have been, and as much as I love educatating folks about vegan and gluten-free lifestyles, I’m oh so ready to be back in the kitchen making the dishes that I want to make. For example, in my office I’ve got a copy of Carole Walter’s Great Cookies which I’m dying to dive into. The first three recipes all feature liquor–liquour in cookies, hello, what’s not to love?! I have been making a few things here and there that aren’t completely Thanksgiving oriented. One was this delicious, seasonal Autumn Apple Buckle. According to this lovely site, a buckle is “a type of cake made in a single layer with berries added to the batter. It is usually made with blueberries. The topping is similar to a streusel, which gives it a buckled or crumpled appearance.” (As opposed to a crumble which lacks the cake layer.) Although my buckle features apples instead of blueberries, it’s still super moist, cakey, sweet, and delicious like any summertime treat. Preheat the oven to 350°. Oil an 8 inch cast iron skillet or an 8 inch cake pan. For the crumb topping: In a food processor, pulse the flour with the brown sugar, cinnamon, and salt. Add the vegan margarine and process until the mixture resembles moist sand. Add the pecans and pulse until just chopped. For the batter: In a medium bowl, whisk the flour with the baking powder, ginger and salt. In a large bowl, using a handheld electric mixer (or using a stand mixer), beat the vegan margarine until creamy. Add the sugar and beat until light and fluffy, about 3 minutes. Beat in the agave. Add the vanilla and soy yogurt and beat until smooth. Add the dry ingredients in 2 batches, alternating with the soy milk and beat at low speed until smooth. Fold in the apples. To assemble: Scrape the batter into the prepared skillet or pan and smooth the top. Sprinkle with the crumb topping. Bake the buckle in the center of the oven for 1 hour, or until the topping is golden and a toothpick inserted in the center comes out clean. Let cool for at least 1 hour before serving. I haven’t yet made any desserts in my cast iron skillets, but I think this may be the first! Also, I love that you’re giving these demos: you’ve certainly become a much more productive and active Virginian in just a couple of months than I have in four years. WOW! I want to go to your alternative Thanksgiving talk, that sounds like it would be so much fun and SO inspiring! And then I want a huge plate of your super tasty looking apple buckle. I’ve never heard of a buckle before but now I’ve got to try one! Buckle up! Sorry, that was lame! Seriously, it looks amazing and I love that you used apples instead of blueberries. Have fun at the demo, and I hope you get to try some cookie recipes soon! That looks delicious! I wish I could go to your Thanksgiving talks…it sounds like they’ve been so informative! We’ll be making this vegan Cornbread Stuffed Acorn Squash for our meat-free Thanksgiving! I hope your talk went well! Hope you had a fantastic demo! While I’ve actually never made a buckle before, I do love the name, and anything with apples and spices can’t ever be too bad. oh jes, congratulations on your talk! That’s so awesome, and also that your recipes are getting more exposure because *they* are awesome. I wanna make buckle now so bad…. yep. I love buckles. This recipe looks great! damn, Jes – that’s one delicious looking buckle! i’d never think to make one with apples. ohhhhhhh, yum! i hope your alternative thanksgiving went well, and i hear ya on itching to get back in the kitchen and make the yummies you want to be cook’n up. liquor–liquour in cookies does sound like some serious awesomeness. yay! I haven’t thought of a buckle in years. That looks fabulous! Yummy! dang… I was going to say GOOD LUCK… but clearly I have to stay on top of my blog reading… I’m sure you were wonderful! Happy Thanksgiving, Jes! 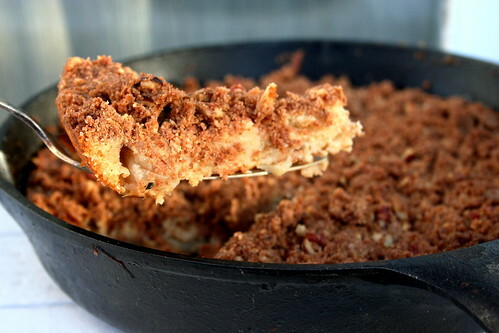 I love making things in skillets so I will have to give this lovely apple buckle a try. BTW: I think it’s so cool you love the community in which you live and are giving back by hosting those demos at the library. You really rock! Damn…I wish I could be there for your demo. That Apple Buckle looks divine.